Geraniums, aka pelargonium, often settles on the window sills of the apartments. This is not surprising because the flower room is unpretentious, but very beautiful. The breeders brought a huge number of varieties of pelargonium with different forms of blossoms and their color. And to grow geranium is very easy, it is propagated by branches, rhizome division and seeds. If you decide to grow geraniums at home on their own, it is better to do this process. Look out with friends beautiful flower, have to break off from his escape and put the house in a pot with fertile soil. Watered and will soon new leaves. 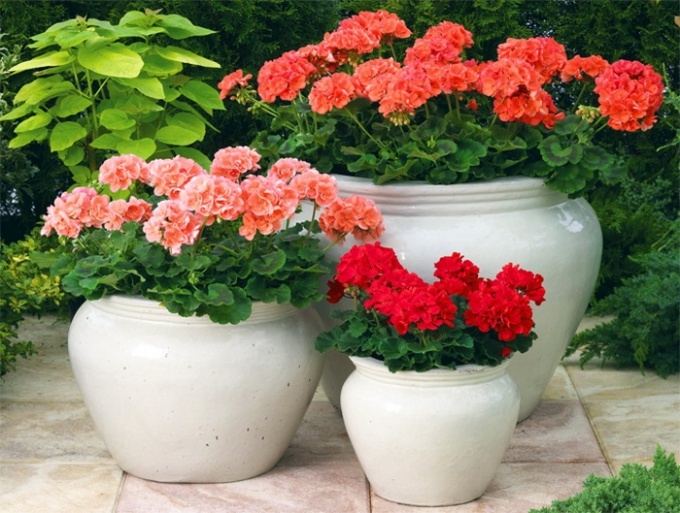 Or first place the process of pelargonium in a glass or jar of water, after a week, the geraniums will root and can be transplanted into a pot with soil. For substrate take purchase ground for flowers. Although it can be done independently. Mix equal parts sand, peat and garden soil. On the bottom of the pot be sure to put gravel for drainage. The second method of propagation of the geranium is the division of the rhizome. If someone you know plan to change the beautiful varietal pelargonium, don't miss your chance to get this flower room of the house. Ask to leave a portion of the overgrown plants and plant home in a pot. So you will have blooming geraniums. And finally, the most difficult, but interesting way is to grow geraniums from seeds. You can buy bags of different varieties which like. To sow seeds of geraniums to the spring. Just arrange them on the soil surface, lightly sprinkle and spray from a spray. Cover with glass or even stretch the pot a plastic bag. It will be a hothouse. Geranium seeds germinate quickly, within 10 days you will appreciate the friendly germs. Remove the teplička. Keep geraniums in a bright window sill. Watering, avoiding drying of the soil. When the seedlings of geranium will grow, seedlings, one plant separately in pots. Bloom geranium, grown from seed, not soon, in six months, but it will be the sort which is not always possible to get the handle. Geranium has the ability to grow rapidly and lose its decorative effect. Therefore, periodically it is updated, by separating the bone and planting it separately. And the old large hive can paraditi in the garden, the geranium grows well on the street and will delight you with blooms until winter. However with the cold weather old Bush street die.